Activities in this 2008 collection include Valentine Probability, Valentine Discrete Math, Valentine Quilts and Valentine Symmetric Faces. See Valentine's Day 2008 to download PDF files for the various activities. This problem requires students to analyze the pattern in the class game and to analyze how a change to the game impacts the results. Download Stand up and Be Counted problem with possible solution. These real-life application problems require students to write algebraic rules and evaluate those rules (functions) for specific situations. Students are also required to write about their findings. Bulldog Travel Agency asks students to evaluate car rental plans from three different companies and recommend the best match, given different family travel plans. Jen and Berry's Ice Creamery requires students to write a profit rule for the store, then use that rule (function) to evaluate the profit, given the number of customers each day. See more Problem Solving Resources for Grades 5-8. 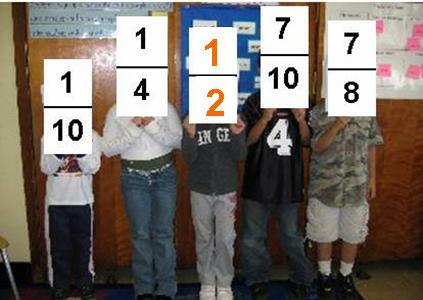 Fraction Sort: provide index cards with various fractions written on them. Challenge students to quickly sort the fractions into two piles: greater than 1/2 or less than 1/2. Have students write about the mental process they used to accomplish this task. As an alternative, write the fractions on cheap paper plates or construction paper, hand them out to students and challenge students to quickly assemble into two groups: greater than 1/2 and less than 1/2 on either side of the 1/2 fraction holder. Extend the sorting activity by asking students to reassemble those two groups in least to greatest order to form a perfect fraction number line. Note: this will definitely produce some serious discussions! Many Names for 1/2: Play Climb the Ladder where all expressions must be equivalent names for 1/2. Students may use words, pictures, numbers, all operations, etc. to rename this landmark fraction. Use the Blank Climb the Ladder Template inserted in sheet protectors so that students may record their mathematical expressions. Follow this activity with a class recording of varied expressions on chart paper or create a bulletin board of class results. Thirteen Ways of Looking at a Half: Challenge students to find the Thirteen Ways of Looking at a Half as suggested on the PBS site. First, demonstrate the activity from the Thirteen Ways of Looking at a Half website. It would be great to use an interactive whiteboard or large monitor to demonstrate the concept and emphasize the importance of record keeping. Next, have students work in pairs or small groups to record their findings on the Thirteen Ways Recording Sheet, developed at Mathwire to simplify student record keeping. Finally, as students groups are sure that they have found all thirteen ways, let groups input the data on the Thirteen Ways of Looking at a Half website. 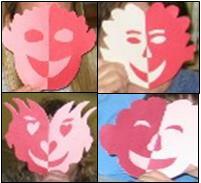 Quilt Square Challenge: provide copies of the quilt squares and challenge students to form the different designs. Note that most of these designs are half black and half white because they are formed from blocks that are half and half. 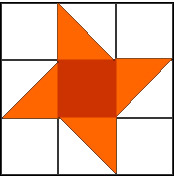 See Quilt Square Challenge for directions and PDF files for both the student squares and the teacher overheads. Have students explore traditional quilt blocks. 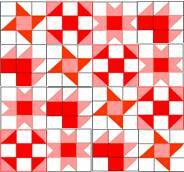 See the Mathematical Quilting Menu for resources. Ask students to identify the fraction of the whole which is represented by each color. 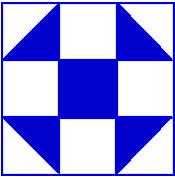 Quilt Treasure Hunt: provide quilt books, math-literature titles or online URLs on quilting. 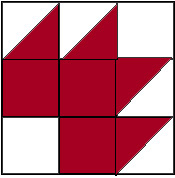 Challenge students to find quilt blocks in which one color represents half of the quilt block. 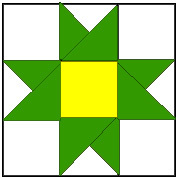 Original Quilt Block Designs: Students may develop their own design or modify a traditional design so that one color represents half of the area of the quilt block. Read Give Me Half! as a humorous introduction to this landmark fraction. See Math-Literature: Fractions to find information on the book and a link to a follow-up activity. This math site is "a collection of leesons, calculators, and worksheets created to assist students and teachers of algebra. While useful in traditional Pre-Algebra or Algebra 1 courses, the site also contains a list of prime numbers and perfect squares which are great resources for middle school students as are many of the algebra topics which are also addressed in a traditional middle school math curriculum. View all of the topics on Algebra.Help. Add this site to the classroom list of basic facts practice. This online practice site offers three different levels of play for students to master division facts. Students are encouraged to complete a row in the least amount of time. Students may also print out their record times. This Resource Room: Free-spirited Structured Multisensory Learning site presents both research links and a very structured approach to learning the times tables, designed to help students who need a more structured approach. This site would be suitable for a classroom approach or for home-study and reinforcement for parents to work with their children. Add this approach to your differentiation strategies to help students who are overwhelmed by multiplication facts. Mastering a few facts at a time, then adding others and integrating the practice of old and new facts is an effective strategy to help students who experience difficulty with the whole-table approach. Check out Times Tables Practice. This is a great addition to the math curriculum resources and would benefit teachers, students and parents as an online resource. This math dictionary is especially suitable for Grades 4-9 as it includes mathematical terms, drawings and examples to illustrate the meanings.